Cozy 3 bedroom, 2 bath lakehouse on Lake Hamilton in beautiful Hot Springs, AR. This home is located off highway 7 South and Amity Road. 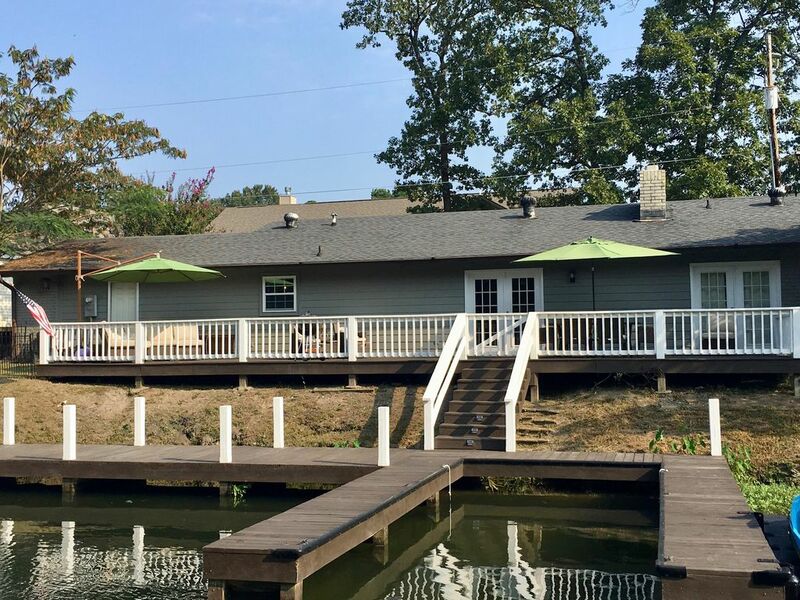 Quiet cove with boardwalk to tie up your boat and minutes from Historic Downtown Bath row, near Oaklawn racetrack and gaming! Close to dining, antiques and Magic Springs and Crystal Falls water park. Book your vacation online today! Really lovely place. We had a very nice stay. Property was easy to get to, well appointed, clean, and very enjoyable. Beds were all very comfortable and the deck was amazing! They draw the lake down beginning in November and it stays low until spring, so there isn't water around the property. We did not know this, so just passing that info along for those planning to visit in the winter. Hot Springs is great any time of year! We had a special time here at Thanksgiving with our family. Comfortable beds and couch. Spacious. Wonderful deck area for eating and visiting. The location and the house are beautiful. We really enjoyed our stay. Very cute house. Beautiful back patio right on the lake. Would love to come back in the summer. We brought some girls and moms to Hot Springs for the races. This house was perfect for us. One bedroom had 4 bunk beds in it so all 4 girls could stay in the same room. Plenty of room for 4 girls and three moms. About 10 minutes from town, beautiful little neighborhood. Driveway a little hard to navigate but other than that, A+! We would love to come back. Perfect place for an informal family gathering. Spent a few days over the Thanksgiving holiday with family and the house was perfect for what we needed. An open kitchen and living area, a big deck outside, and plenty of sleeping space! The place was decorated nicely, but it still felt comfortable and homey. The house was cozy and decorated so cute! There was plenty of space, and it was in a great location. The homeowner was great at communicating with me, and she answered all of my questions. The house was easy to find, even in the dark. We will definitely stay here again!